Note that on Skylake, Kabylake (and the now cancelled "Broxton") SKUs, functionality such as power saving, GPU scheduling and HDMI audio have been moved onto binary-only firmware, and as such, the GuC and the HuC blobs must be loaded at run-time to access this functionality. Enabling GuC and HuC on Skylake and above requires a few extra parameters be passed to the kernel before boot. It may be wise to install the linux-firmware-nonfree package as it may contain extra firmware blobs on Ubuntu releases prior to 16.04LTS. Don't install this on 16.04LTS and above. The intel_pstate=skylake_hwp option enables Intel's Hardware P-States, known commonly by the marketing moniker "SpeedShift". Note that Intel's IOMMU for VT-d (enabled in the kernel by passing intel_iommu=on to the kernel boot options) cannot be used together with frame buffer compression (i915.enable_fbc=1 argument passed to the i915). Frame Buffer Compression will be disabled automatically to prevent screen tearing in this case. Your modern Intel HD Graphics processor graphics will work just fine. You will note that many options default to -1, resulting in per-chip power-saving defaults. It is however possible to configure more aggressive powersaving by using module options. Warning: Diverting from the defaults will mark the kernel as tainted from Linux 3.18 onwards. This basically implies using other options than the per-chip defaults is considered experimental and not supported by the developers. On Linux 4.16+, GuC firmware loading and submission is now handled by the enable_guc parameter in place of the former enable_guc_loading=1 and enable_guc_submission=1 parameters. Adjust as needed. The available enable_dc values are a bitmask with bit values RC6=1, RC6p=2, RC6pp=4 - where "RC6p" and "RC6pp" are lower power states. This is not needed on server-grade SKUs where Xorg is unwelcome. This is often observed as font and screen corruption in GTK+ applications (missing glyphs after suspend/resume). See this bug here for more details. Which configuration file needs the tear free option? The xorg.conf file. Updated to reflect that. Thanks for the info, now i have enabled guc and huc firmware in gentoo. Do you happen to now why are disk unrecognized (kernel panic) if i set the gpu as modules in the kernel? It might be a bug in the kernel package you're running. In recent kernels (for example 4.12), intel_pstate=skylake_hwp isn't listed as an option (https://github.com/torvalds/linux/blob/v4.12/Documentation/admin-guide/kernel-parameters.txt#L1604). Maybe it was removed, but that string doesn't appear in the source anywhere. The pstate driver Just Works on my desktop (using hwp), and has since at least 4.10 (when I got this hardware) without using any options. in my kernel log, with i915 options all at their default settings. (Linux 4.12.8-2-ARCH, but I've seen this on 4.10 and 11). My firmware blobs are the latest versions. Am I missing out on any performance here? Linux drm loads the DMC 1.26 firmware, but I guess GuC may not even be enabled by default? The regression you're seeing should be fixed. You may want to run the latest Xorg and Mesa stack on your host. If you're on Ubuntu, run the xorg-edgers PPA and the Oibaf PPA. Since you seem to be on Arch, keep your host machine up to date. By default, Arch runs the latest and greatest mesa stack available. Do i need to something else to these parameter to take place? I rebooted and they didn't take place. And what's the output of lspci ? now cat /sys/kernel/debug/dri/0/i915_guc_load_status finally shows that FW is loaded. great guide! It seems that you know what you are talking about. I came to this guide, because I have been searching for solutions of my problem a lot. Maybe you could help me. The problem is, when i connect external monitor trough HDMI, it gives me only 2048x1080, but monitor is 2560x1440. Tried different cables, monitors, different solutions on web, none of that worked for me. I'm on Ubuntu 17.10, but tried other distributions - same. On windows it works fine. Maybe somebody here could point me to the solution. Your manual above is extremely helpful! Than you so much. Now that I set up my system right, I have two unresolved items. I noticed that your question mentions VLC. Note that for VLC, they explicitly support VAAPI-based decoding through a specific libva branch ONLY. If this has changed (and does not reflect the content on the Wiki), I'll be glad to retest and verify. I'll follow up with the resolution issue you mentioned shortly. And the make of your display? Most likely your display is sending the wrong EDID data. But without a dmesg log (with drm debugging enabled) I cannot rule this out as the case. Regarding VLC and libva branch - the page mentioned on a VLC wiki is obsolete - do not exist. New page https://github.com/gbeauchesne/libva and libva-intel-driver - those pages are also more than 3 years old and do not support Intel Kaby Lake. I've tested VLC (below) with video output=OpenGL and vdpau. At more demanding h.265 CPU usage rise to 50% and GPU use to12% - that is opposed as it should be - high GPU and low CPU usage. Why? As GPU usage is not null, I suppose HW acceleration works but very low GPU utilisation. VLC works much better. At some other tests with h.265 video and VLC show 50% drop of CPU usage and about same GPU usage if used video output=OpenGL oposed output=vdpau. Do you have any suggestions? My main goal is excellent HW acceleration with ffmpeg, VLC is not important to me. On multiple modern/recent hires laptops it's necessary to set "i915.edp_vswing=2" on the i915 module. This is most certainly the case for the Razer Blade Stealth (late 2017 model), but it exists on others as well. So, if you have a recent (Kaby Lake/Kaby Lake R) based laptop and are experiencing flickering that reminds you of poor TV reception from the 60s/70s (maybe even 80s), try this! For me, the rest of the recommended i915 "flicker fixes" fail. So i915.enable_guc=-1should be added to /etc/default/grub (value "-1" works for me and loads GUC and HUC on my Kaby Lake i5-7200U). 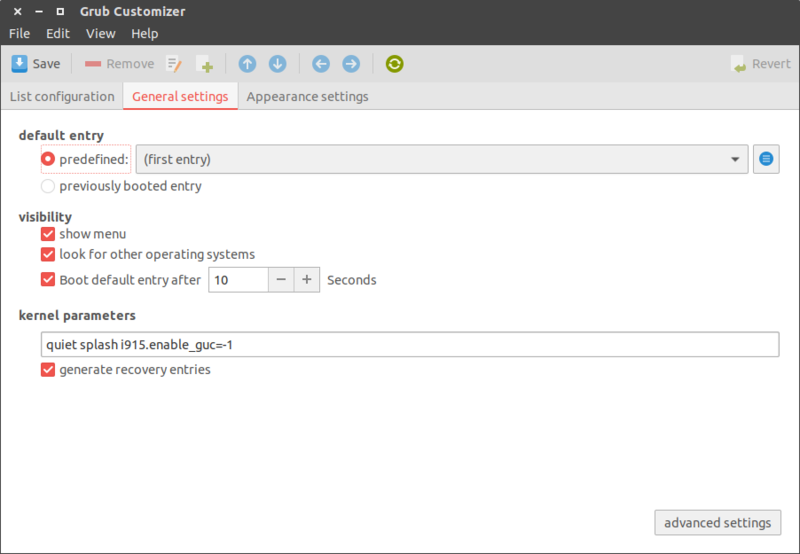 @miniworm I set this options i915 enable_guc=1 into /etc/modprobe.d/i915.conf and check load status. GuC loaded successfully, but HuC did not load. Do you happen to know why? Thanks for the updates @miniworm and @vietzerg. I'll follow up with them. Are you running the latest kernel + firmware blobs? I'll update the gist shortly with instructions for both. My experience with adding options to /etc/modprobe.d/i915.conf is not so good (at least on my Ubuntu 16.04 and 18.04), simply it doesn't work, and that's why I've added option to /etc/default/grub. This way it always works for me. Anyway IMHO this option with value 1 loads only GuC (the same way value 2 loads only HuC). That's why I've used -1 and it works for me. The thing which surprises me is why default values is 0 not -1. Normally you don't need GuC&HuC loaded? Strange IMHO. @Venemo what version of the Linux kernel are you running? enable_rc6 was removed towards the end of 2017. Afaik it's gone since 4.15. I'd recommend setting enable_guc to -1 instead, i.e auto/let the driver detect what options are available instead of forcing it on. If that results in it not being enabled for your system there's probably a good reason for it. In my case that results in enable_guc = "3" according to systool -m i915 -av, both GuC and HuC. Annoyingly enough this still causes the kernel to be marked as tainted. If it returns intel_pstate just leave it be. @Brainiarc7 I'm running 4.17-rc6 currently. Yes, that option has been removed. I'll need to update the documentation as appropriate. I have also face same type of issue. But I don't know how to resolve it. Please help us. Do you still have the issue above? And what hardware are you on? enable_guc=3 caused me a lot of problems with external monitors. Enable it with care. What's the make of your system, and what Linux kernel version are you running?